Many Texas residents would appreciate a bath after being battered by Hurricane Ike, even if from the end of a fire hose. "A good bath would be nice: have the fire department swing by and spray us down," said Carlos Silliman, 48, as he sat on a picnic bench in front of his Galveston Island home, where 18 inches of water flooded his garage and ruined a freezer full of venison. "I'm ready to have a cold beer and read the paper." More Hurricane Ike relief is on the way for evacuees Tuesday, but tens of thousands of people are waiting for food, water and ice, for the electricity to return to their homes or for their first hot meal and shower. The number of distribution centers was to be quadrupled to 60 by the end of the day to deliver food, water and ice. Still, for some, the wait for a return to normalcy could be days. For others, it could be weeks. For most, such luxuries are far beyond the horizon. Many service stations have no gasoline, and some major highways remain under water. More than 30,000 evacuees are still living in nearly 300 public shelters, and roughly 2 million people in Texas alone are without power. Ike's survivors have already walked for miles and waited for hours at supply distribution centers, gobbling up all that was offered: 1 million bottles of water, 1 million meals and 600,000 pounds of ice in just the first 36 hours after the storm passed. It's not enough, and those dispatching truck after truck to distribution centers around the city know it. One such center north of Houston drew 10,000 people Monday in search of food and water. "That process will continue 24 hours a day," said Federal Emergency Management Agency spokesman Marty Bahamonde. "We'll never be empty of trucks at the staging area and the goal is to never be empty at the points of distribution." President Bush took an aerial tour of the damage Tuesday, then immediately urged Americans to give money to help people recover from Ike. He warned against letting "disaster fatigue" slow donations when the need remains great. "I have been president long enough to have seen tough situations, and have seen the resilience of the people to be able to deal with the tough situations," Bush said. "I know with proper help from the federal government and the state government, there will be a better tomorrow." Recovering from Ike is going to be a long proceses: Beaches are scoured clean of vacation homes, oil-slicked water and beaches are coated with a sheen in Galveston — even burial vaults were wrenched from the soggy ground by the storm's surge. Officials on the barrier island said it could be months before the city of Galveston reopens. The main gas and a primary electric transmission line to the island were severely damaged by Ike, which also tore at the wharves in the city's port. Officials warned that mosquito-borne diseases could begin to spread after one elderly man was airlifted to a hospital covered with hundreds of bites. "Galveston can no longer safely accommodate its population," City Manager Steve LeBlanc said. "Quite frankly, we are reaching a health crisis for people who remain on the island." 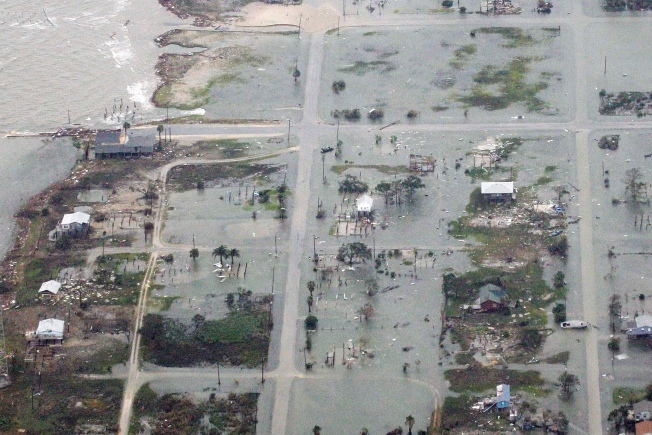 Across the entrance to Galveston Bay on Bolivar Peninsula, a resort community where entire neighborhoods were obliterated by the height of Ike's storm surge, only one or two buildings remained standing in the town of Gilchrist. Aaron Reed, a spokesman for Texas Parks and Wildlife, said the town "is almost completely gone. Like somebody took a razor and went pffft." Bolivar Peninsula is home to about 30,000 people during the peak summer season, but after scouring almost all of the western end of the peninsula by nightfall Monday, officials said they had found no dead. But Reed said he had spoken with residents who weren't able to find fellow holdouts after the storm, and he feared their bodies might turn up as the waters recede. Home designer and builder Bobby Anderson limped off the peninsula late Monday in a pickup truck battered by the storm, saying Ike swept out to sea a woman who had clung with him to a building's rafters. When asked to describe their ordeal, he refused. "I'd really rather not," Anderson said. Ike's death toll officially stood at 40 Tuesday, with most of the deaths coming outside of Texas. Among those killed in the state were at least three people who died from carbon monoxide poisoning after using generators. Still, there are signs the recovery is moving forward. Houston Assistant Fire Chief Rick Flanagan said emergency calls dropped dramatically by Monday afternoon, and Mayor Bill White rescinded a mandate to boil water. White also said residents of the Clear Lake area, which had been under a mandatory evacuation order, could safely return home. There also were signs the oil industry was perking back to life: Valero Energy Corp., North America's largest refiner, said it had regained limited power at two of three shuttered facilities — in Houston and Texas City — while its plant in Port Arthur remained dark. At the Justine Apartments in downtown Galveston, residents were surviving with a hibachi grill, a coffee maker, and a stash of beer, wine and liquor. Meals Ready to Eat were dropped off by the National Guard. Linda Lennon, 58, suggested the beef stew. "We're all sticking together," she said.